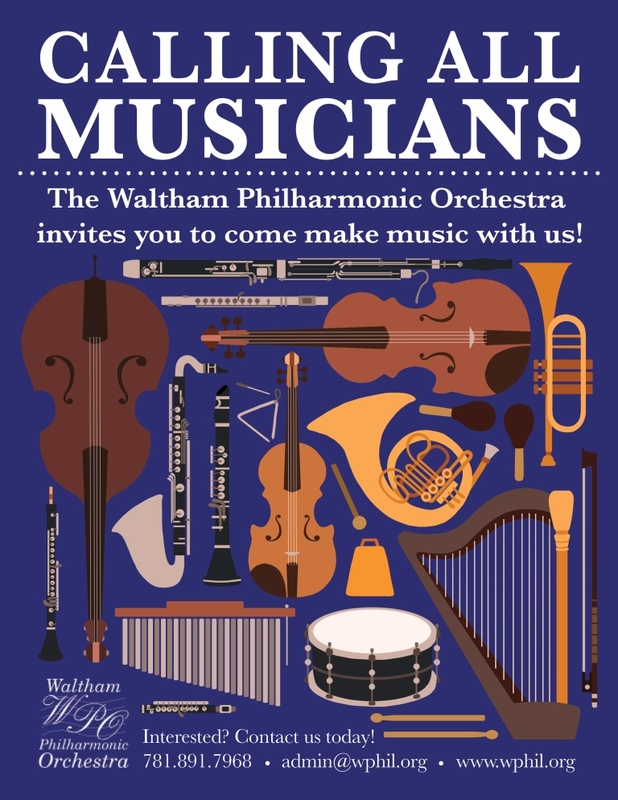 If you love making music and enjoy the camaraderie of fellow musicians, the Waltham Philharmonic Orchestra is for you. We are a non-audition orchestra and currently have openings in the horn, bassoon, and all string sections. Please email Executive Director Stephanie Schaffhausen for more information on joining. We perform a great mix of beloved standard pieces and more challenging, creative programming. Our award-winning Music Director, Michael Korn, sets a standard in which our musicians push the envelope of their talents, yet have a very satisfying experience and sense of accomplishment after every concert. The WPO performs four concerts a year – three regular season concerts and one Pops. Click here for detailed information on the upcoming season. Highlights include: Paganini Violin Concerto, Gliere, Concerto for Coluratura, and music from Australian composers. We are also always looking for musicians to join chamber groups that play throughout the community! Please contact Andi Zhang, General Manager for more information.